Nathaniel Hackett‘s Packers meeting went well. Green Bay is bringing the former Jacksonville offensive coordinator aboard as its OC, Ian Rapoport of NFL.com reports (via Twitter). The Jaguars fired Hackett midway through this season, and he interviewed for the Lions’ OC job. He’ll now join Matt LaFleur‘s staff and play a major role in revamping the Packers’ offense. The Packers interviewed Hackett and recent Browns OC hire Todd Monken for this job and are set to entrust key Rodgers prime seasons to two recent AFC South offensive coordinators — both 39. LaFleur has less experience being an offensive coordinator than Hackett; they will pair up in hopes of guiding the Rodgers-centered team back to the playoffs. This will be Hackett’s third NFL OC gig. He served in that role under Doug Marrone at Syracuse and then with the Bills before following Marrone to Jacksonville in 2015. The Jaguars promoted him to OC during the 2016 season. Neither of Marrone and Hackett’s Buffalo units ranked in the top half of the league, and they took a major step back this season. But in 2017, the Jags ranked in the top six in both points and yards on their way to the AFC championship game. Despite their 2018 descent, the second-generation coordinator will land on his feet. And after working with the likes of E.J. Manuel, Kyle Orton and Blake Bortles, Hackett will now oversee the work of one of the best quarterbacks in NFL history. Quite the change of scenery. Former Jaguars offensive coordinator Nathaniel Hackett is in Green Bay interviewing for a top offensive job on the Packers‘ staff, a source tells Ian Rapoport of NFL.com (on Twitter). He previously interviewed with the Lions for their OC job, Rapoport adds. It’s not immediately clear whether Hackett is up for Green Bay’s OC job, but he’s presumably in the mix to be Matt LaFleur‘s top offensive lieutenant. The Lions job is still open, meanwhile, so Hackett could land on his feet after his November dismissal from Jacksonville. Hackett joined the Jaguars as their quarterbacks coach in 2015 and took over as offensive coordinator midway through the 2016 season. The Jaguars finished sixth in total offense and first in rushing offense last year, but they were unable to reprise that performance in 2018 under Hackett. The Jets likely preferred Baylor’s Matt Rhule to Adam Gase, but as previously reported, things fell apart when Rhule refused to allow the Jets to pick his staff for him. The Jets especially wanted to choose his offensive coordinator and Rich Cimini of ESPN.com (on Twitter) hears the Jets floated Todd Monken to him as an option. The Cardinals asked, but were denied, permission to interview 49ers run game coordinator Mike McDaniel for their offensive coordinator position, Matt Barrows of The Athletic tweets. McDaniel is tight with head coach Kyle Shanahan and the team was not prepared to lose him, especially to a divisional rival. “It appears” that Steve Sarkisian and Nathaniel Hackett are in the mix for the Lions‘ offensive coordinator vacancy, Alex Marvez of SiriusXM tweets. The Lions have been looking for a new OC ever since Jan. 1 when they announced that Jim Bob Cooter‘s contract would not be renewed. Sarkisian has also spoken with the Cardinals about their OC job, Marvez tweets. Sarkisian has been on the market since Dec. 31 when he was fired by Atlanta. Both the Cardinals and Browns have sought permission to interview Jets running backs coach Stump Mitchell, a source tells Josina Anderson of ESPN.com (on Twitter). The position(s) he’ll be discussing with those teams are unclear, however. The Jaguars fired offensive coordinator Nathaniel Hackett, according to Adam Schefter of ESPN.com (on Twitter). The Jaguars are 28th in points scored this season and they believe the offensive play calling is at least partially to blame. The Jaguars dropped to 3-8 on Sunday with their loss to the Bills. Leonard Fournette averaged 5.3 yards and gave the Jags two of their three scores, but it wasn’t enough to pull out the win. The loss pushed them from extremely unlikely to make the playoffs to mathematical elimination and that led to the firing of their OC. Some would argue that Hackett has not been given the right personnel in Jacksonville, starting with quarterback Blake Bortles. Bortles completed just 12-of-23 passes for 127 yards, one touchdown, and two interceptions. After the game, head coach Doug Marrone said that he did not consider making a QB change, but the club did feel the need to shake up the staff. Hackett joined the Jaguars as their quarterbacks coach in 2015 and took over as offensive coordinator midway through the 2016 season. The Jaguars finished sixth in total offense and first in rushing offense last year, but have been unable to reprise that performance in 2018. Hackett served under Marrone at Syracuse University and with the Bills, so it’s not clear whether this was a decision made by Marrone or by the higher-ups with the Jaguars. In either case, the pressure is on in Jacksonville, and Marrone is far from safe this offseason. 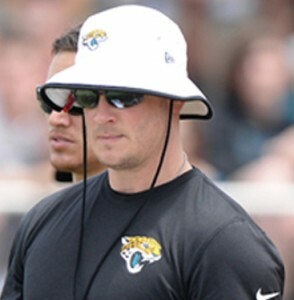 The Jaguars have announced that Nathaniel Hackett will be retained as the club’s offensive coordinator. Hackett was promoted from quarterbacks coach to interim offensive coordinator in late October following the firing of previous OC Greg Olson. Hackett, 37, has a strong professional relationship with the new Jaguars head coach, having worked as Marrone’s offensive play-caller at Syracuse and with the Bills in the past. He’ll now be tasked with resurrecting a Jacksonville offense that regressed mightily in 2016, and specifically will be asked to continue the development of quarterback Blake Bortles. Hackett becomes the second coordinator to retain his title under Marrone, as defensive play-caller Todd Wash will also return in his same role. Of course, Hackett’s hiring means that former 49ers/Eagles head coach Chip Kelly — the only other known candidate for the Jaguars OC position — won’t be joining the staff, at least as the play-caller. At present, the Jets and Bills are the only clubs still searching for offensive coordinators (technically, the Rams are as well, but new head coach Sean McVay has announced he will call the plays). 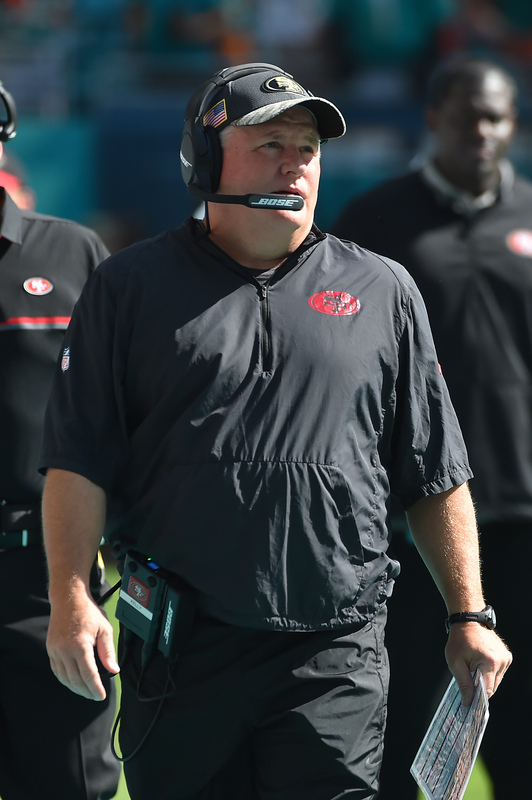 Chip Kelly is in Jacksonville today interviewing for the team’s offensive coordinator position, Hays Carlyon of 1010XL reports (on Twitter). The Jaguars are interviewing multiple OC candidates, with Nathaniel Hackett expected to receive one as well, Ian Rapoport of NFL.com tweets. This is a second summit between the Jaguars and Kelly. Before taking the interim tag off of Doug Marrone‘s head coach title, the Jags interviewed Kelly for that position. So, there seems to be a lot of interest on the Jags’ part in the twice-fired head coach. Kelly has not interviewed for a job with another team this offseason. The Jaguars agreed to retain Hackett, who took over the OC job from Greg Olson after the team fired Olson during the season. However, it appears Hackett will have to vie with other candidates to become the full-time Jags OC. This marks the first official interview the Jaguars have conducted for the OC job. Despite being fired after only one season with the 49ers, Kelly did help Colin Kaepernick have a better season than he did in 2015. Although, the coach’s career arc has pointed downhill since his debut campaign with the Eagles that ended in the playoffs. But the Jaguars saw Blake Bortles regress this season and could be looking for an unorthodox voice to help the former No. 3 overall pick. Kelly, who was eyeing NFL OC jobs shortly after being fired, has evidently piqued the revamped Jags decision-making group’s curiosity. New Jaguars executive Tom Coughlin attempted to hire Kelly as an offensive assistant before he took the job at Oregon, as Adam Caplan of ESPN.com points out (on Twitter). Kelly’s Eagles went 4-1 against Coughlin’s Giants. Major changes are coming to the Jaguars, but some things will stay the same. Newly promoted head coach Doug Marrone is going to keep offensive coordinator Nathaniel Hackett, according to Jason La Canfora of CBSSports.com (on Twitter). Tight ends coach Ron Middleton will also stay in his current position. After previously serving as the team’s quarterbacks coach, Nathaniel Hackett was promoted to OC in October 2016 following the dismissal of Greg Olson. It was expected that Hackett would remain in his role once Marrone was given the job since the two have a long history together. When Marrone was the head coach at Syracuse, Hackett was on the staff as quarterbacks coach and tight ends coach before ascending to OC. When Marrone became the Bills’ head coach, he brought along Hackett, then just 33 years old, to be his OC. In fact, he was so high on the enthusiastic young coach in 2013 that he did not interview other candidates for the job. “I have confidence that one day soon we’ll look back on today’s news as the moment that inspired and ultimately established the Jacksonville Jaguars as a football team that wins, week to week and season to season. “I am honored to welcome Tom Coughlin back to Jacksonville, where winning was customary under his leadership. I know he expects the same in his return to head our football operations, and that’s good news for us and Jaguars fans everywhere. The extension of Dave Caldwell’s contract speaks to his excellent work thus far and the continued importance of complementing our talented and promising roster. Bortles certainly sounded optimistic about the hiring. “I think Doug has earned the respect of the offensive players and I’m excited for him to get this opportunity and the direction of this team,” Bortles told DiRocco. Rosenthal notes that offensive coordinator Nathaniel Hackett will presumably keep his role. Hackett worked under Marrone with Syracuse and the Bills. Meanwhile, Albert Breer of TheMMQB.com tweets that the Jaguars’ defensive coaches were told they’d be retained if Marrone got the job. Alex Marvez of The Sporting News provides even more clarity (on Twitter), noting that the team will at least be keeping defensive coordinator Todd Wash and linebackers coach Robert Saleh. Mike Smith was thought to be a close second for the Jaguars job, Charles Robinson of Yahoo Sports tweets. The former Falcons head coach served as the Buccaneers defensive coordinator this past season. In seven seasons in Atlanta, Smith led his squad to a 66-46 record and four playoff births. Roy Cummings of FloridaFootballInsiders.com writes that Smith is still in the running for the Chargers‘ head coaching gig. The Jaguars have made a coaching change after all. 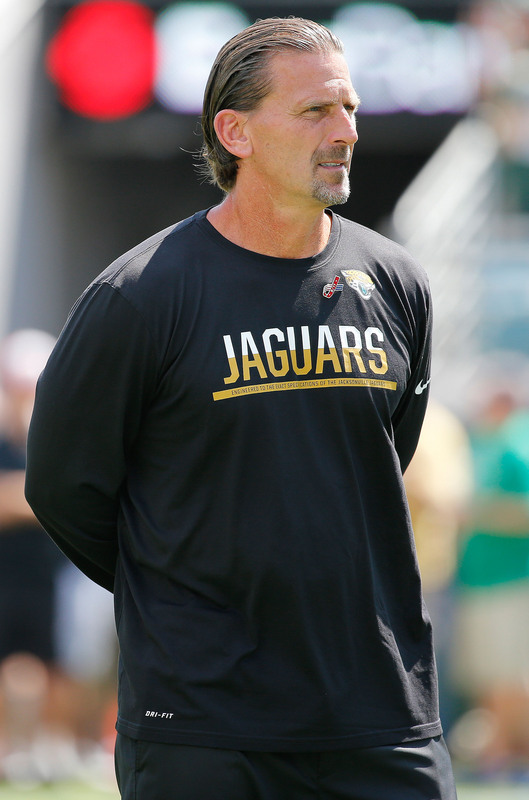 The club has fired offensive coordinator Greg Olson, according to Adam Schefter and and Adam Caplan of ESPN.com (via Twitter). Quarterbacks coach Nathaniel Hackett will take over as Jacksonville’s play-caller, tweets Ian Rapoport of NFL.com. After Jacksonville lost in an emphatic fashion to the division rival Titans on Thursday night, owner Shad Kahn expressed his displeasure with the club’s performance but did not make a move to relieve head coach Gus Bradley, whom recent reports have indicated is safe through the 2016 campaign. Bradley, too, publicly supported his coaching staff, but did not specifically endorse any individual coach following the loss. Indeed, Bradley has experienced a “disconnect” with Olson for some time, per Rapoport (Twitter link), who adds that Bradley felt the offensive coordinator had abandoned an emphasis on the rushing attack. The Jaguars currently rank 31st in the NFL with only 72.6 rushing yards per game, and place 29th in Football Outsiders’ rushing DVOA. Jacksonville’s passing game hasn’t been especially effective either, ranking 28th in DVOA as quarterback Blake Bortles has seemingly regressed in his third NFL season. Through seven games, Bortles has only completed 60% of his passes while posting 12 interceptions and nine touchdowns. And Bortles’ statistics don’t paint the entire picture, as Thursday night’s game was evidence that he can pad his numbers late in losing efforts. Of course, the man taking over for Olson was previously Bortles’ position coach, so it’s fair to wonder if the young signal-caller will be able to improve over the second half of the season. Hackett, 36, has previously served as the offensive coordinator for both the Bills and Syracuse, but has been with the Jaguars since 2015. According to Caplan (Twitter link), Hackett will likely aim to help Bortles to release the ball in a quicker fashion in an effort to stave off opposing pass rushers. Olson, 53, had been in his second stint with Jacksonville, having served as the team’s assistant head coach and quarterbacks coach during the 2012 campaign. He’s acted as play-caller for a number of NFL teams, including the Lions, Rams, Buccaneers, and Raiders.